Facebook is once again making some changes to its guidelines and terms of service for business pages. 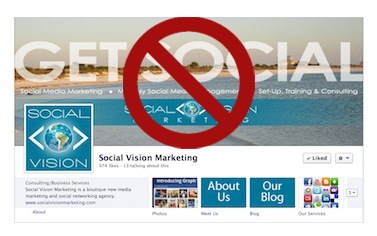 As of January 15th, 2013, ALL Facebook Cover Photos and ads will now be restricted to just 20% text. So, what ARE the official rules for Cover Photos? Contact information, such as a web address, email, mailing address, or other information intended for your Page’s About section. References to user interface elements, such as ‘Like’ or ‘Share’, or other Facebook site features. Cover photos may not be in violation of Facebook’s official terms. The rumor is that Facebook has been cracking down on violators of these rules. NOW is the time to replace your cover photo. For best results, we recommend creating a cover photo that is sized correctly at 851 pixels by 315 pixels. If you need help, give us a shout! You must also note that any logos within a Cover Photo DO count towards your text limit, so choose your images and build wisely! UPDATE: There is now a handy tool to tell if your cover photo is in compliance with Facebook’s rules. Click on this link and just type in your Page’s URL. For example, our page is /socialvisionmarketing.